When its flames at last receded, only the charred husk of a world remained. …Could anyone truly be foolish enough to repeat that mistake? 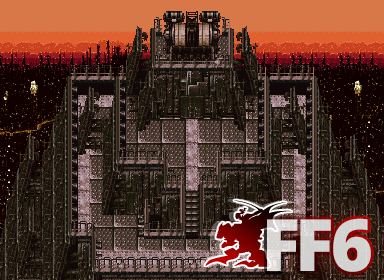 Although no longer the oldest game we cover, Final Fantasy VI was the game in honor of which this site was founded, and with good reason. Many Final Fantasy gamers, young and old, look upon it fondly as one of their favorite games of the series. With its well-developed characters and familiar themes of magic, power, and the human dream of happiness and a peaceful life, it is clearly a must-play RPG. The Caves of Narshe Final Fantasy VI section is full of character, weapon and armor information, walkthroughs, fanart and fanfiction, and more. Please use the links provided to the side of the screen to view information and other FF6 related pages. Our guides cover no fewer than five platforms, due to the magic of nostalgia and digital download; we of course cover the original release for the SNES, but also the nearly-identical PlayStation version. That also gives us coverage for the downloadable versions for Wii and PlayStation Network, as those releases are identical emulated ports of the same release for older consoles. Finally, we even cover the Game Boy Advance version with its two new areas to explore in the post-game.